CASE STUDY: How Pulse Candy made it a success and reached Rs 100 Crore in just 8 months? Home > Blog > Blog > CASE STUDY: How Pulse Candy made it a success and reached Rs 100 Crore in just 8 months? 2) Why Pulse Candy was a huge success? In this digital era, there is still the existence of one category of advertising that truly stands out – Word of Mouth! And Pulse candy has proved that no form of marketing beats product marketing, and this candy has surpassed all competition and beaten all the records by crossing the 100 crore mark in just 8 months! This figure equals the record for heavily advertised Cole Zero, Coca Cola’s diet drink! Founded in 1929, the Dharampal Satyapal group is involved in a variety of sectors likes Food Beverage, hospitality, agro forestry, tobacco, and packaging and mouth fresheners. Under its umbrella, it manufactures Catch spices, Pass Pass mouth freshner, Rajnigandha Pan Masala as well as Ksheer dairy products, including milk, ghee and dahi. In its confectionary sector, it manufacturers Pass Pass Chingles and Pass Pass Pulse. Why Pulse Candy was a huge success? 1 rupees salty sweet game: A sensational flavor of kachha aam, then kala namak type flavor and then sweetness of raw green mango. Easy availability: it is available at each corner of the city. Unique colored wrapper: Attractive packaging with black and green color on it, and named pass pass on it. Extensive research on the flavor: Research for more than 2 years on taste. In low price high volume, there is always a need of developing a sale story for the salesman, to enable them to place the product at the outlet, and for the retailer to push the product trial to the customers. Once the trials made started gaining traction, the product strength took it forward. Word of mouth started catching up as most people started referring the candies to their friends and colleagues. At some places it became a mouth freshener of sort after lunch at others it was a regular get together Candy among friends in a college class. The word had set in. The awesome part of its success story is that Pulse has hardly spent a single penny on any marketing. The whole lift in demand is due to word of mouth publicity. Demand is much more than the supply and currently the company is able to meet only 60-70% of the demand, said Shashank Surana, vice-president, DS Group. Indian customers usually buys candy in single pieces, but in the case of pulse candy, consumers are buying in bulk—five to 10 in one go. At present, DS Group produces 300-400 tonnes of Pulse candy each month. Once Pulse reaches most top towns, DS Group plans to start promotions and a brand-building exercise. With the rising demand of Pulse it started selling at a premium, it had to be supported well through the distribution. More than 80% market coverage, frequent refillment, and overall tight distribution norms helped Pulse be available ate every nook and corner of the city. Launch in Rajasthan and Gujarat was followed up by launch in UP & Delhi. 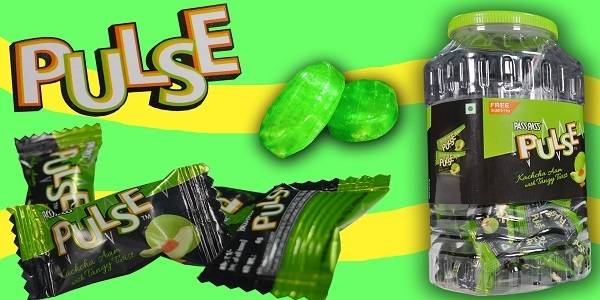 At 2015 end, a new Guava flavor of Pulse candy was launched in the market. The company crossed 100 Crore mark in January this year which was set to be achieved by the end of March. With nearly no advertising and minimal merchandising, Pulse is a story of product being the ultimate winner. The best strategy for D S group is still to develop a product that speaks for itself, maybe it Pass Pass or Catch mineral water. The journey of Pulse has just begun and it rightly aims to be among the top 3 candies in India.